What could be the best way to rejuvenate our busy lives and find some free time from our busy schedules? Well, there is nothing more effective than travelling to do this job. Uttarakhand is one of the most sought after places among the travellers. Particularly during the summer season, millions of tourists flee to Uttarakhand on a regular basis. Lansdowne, a cantonment town in the Garhwal district of Uttarakhand is one of the most popular spots among the tourists. This town was developed under the British rule and was considered as an important centre of freedom fighters of India. Lansdowne is one of the quietest hill stations of India and holds a terrific historical value. This town is situated at a height of 1706 meters above sea level and is beautifully surrounded with thick oak and blue pine forests. Lansdowne’s pleasant weather and natural beauty leaves a lasting impact on the visitors and therefore is a perfect weekend destination. Here are top 5 places to visit in Lansdowne that you should not miss on your trip to this beautiful town. Tickets: 50 INR per person. Opening Timings: Open all days from 9 am to 12 pm & 3 pm t0 6 pm. Darwan Singh Sangrahalaya is often categorized as a War Museum and is situated in the central part of Lansdowne. This museum is exclusively managed by the Indian Army and is the only building of Defence Forces that is accessible to the visitors. Darwan Singh Museum displays a large number of memorable collectibles from different wars that have been fought by the Garhwal Rifles regiment of the army. The museum contains a fine collection of historical items and artefacts such as currency notes from Pakistan and flags belonging to the imperial rule. Cab services are available from Gandhi Chowk to this museum. Take a stroll through Gandhi Park. Tickets: 10 INR per person for museum visit. Opening Timings: Open all days from 8 am to 5 pm. 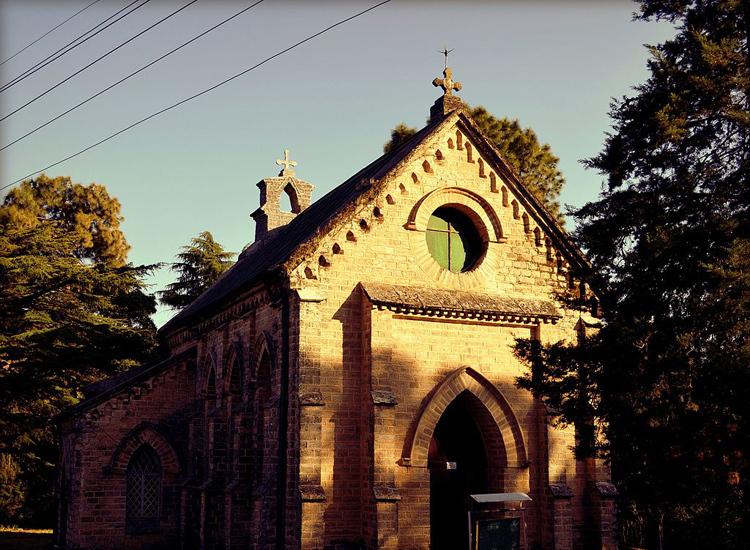 St. Mary’s Church is an Anglican church and is situated at the ‘tip n top’ hill point of Lansdowne. This church has recently been converted into a reading room by the people of Protestant faith who live in this town. St. Mary’s Church attracts a significant number of visitors because of its beautiful walls and stained glass windows. Attend the audio visual presentation at 8 am. Visit St. James Church enroute. Tiffin Top and Snow View are two vantage points that offer a superb view of the snow covered mountain range of Chaukhamba and Trishul. Tiffin Top is also known as ‘Tip N Top’ and is situated on a ridge near the St. Mary’s Church. The view of sunset from these vantage points is the most remarkable sight her. You can also visit Tiffin Top for picnic and trekking purposes. Famous for: Hinduism, Nature, Science defying. Bhim Pakora is situated on Dhura Road on the outskirts of Lansdowne town. This place is known for a rock which is believed to be so strong that it would not topple down the slope no matter how hard you push it. Bhim Pakora traces its origin from the ancient Indian epic ‘Mahabharata’. As the legend goes, when Pandavas were in exile, Bhim took a small rock and placed it atop another rock here on the outskirts of Lansdowne. You will find the visitors trying to topple this rock at Bhim Pakora. Interestingly, this rock just moves at its own centre but never topples down the slope. Distance from Lansdowne: 1 hr 23 min (37.3 km). Tarkeshwar Mahadev is a temple with its deity being Lord Shiva and is at a height of 2092 m from the sea level. 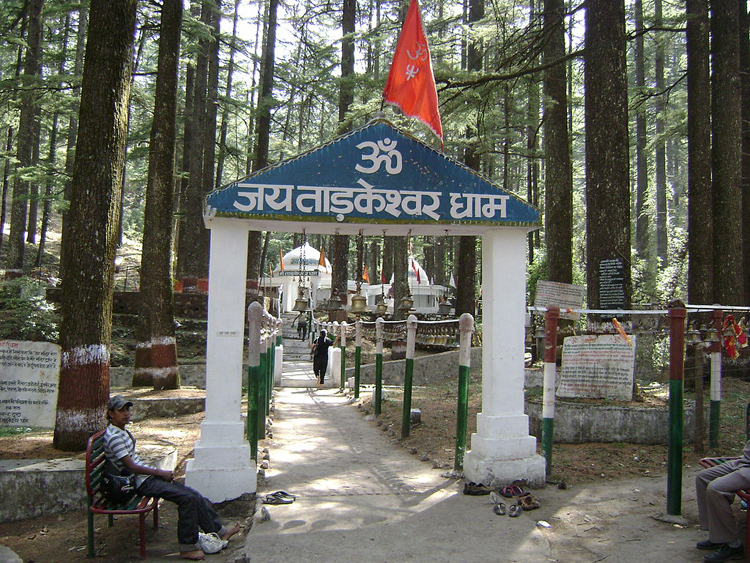 This temple is surrounded by a thick network of Cedar Trees and is located on the Lansdowne-Deriakhal Road. Tarkeshwar Mahadev, which usually takes around one hour to reach from Lansdowne, is one of the most ancient ‘Siddha Peethas’ of the country. You should not miss this place on your trip to Lansdowne as it is a wonderful example of the natural magnificence of this town. Stop at Swami Rama ashram. View the natural trishul made by deodar trees. Other places of interest around Lansdowne are Bhulla Tal, Durga Devi Temple and Hawaghar. Lansdowne is among the most soulful destinations of Uttarakhand. This town also offers activities like trekking, bird watching, boating and paddling. Visitors often prefer this town because of its close proximity to the national capital of Delhi. So if you are looking for a perfect weekend getaway from your busy schedule, Lansdowne should be on the top of your list.